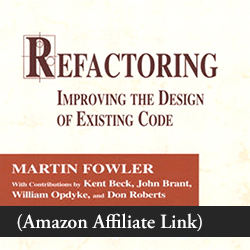 » Why Is Random Order a Big Deal for Test Quality? Why do we do these awful hacks? When one test runs, it may leave side effects behind. The temptation is strong to use these side effects as the starting point for the next test. How does test ordering bite us? This is important because tests are not a fixed system. We add new tests. We delete tests that no longer add value. We run them individually. To avoid problems as our test suites grow and change, it’s important that the test cases inside remain independent. I’ve seen this more than once. 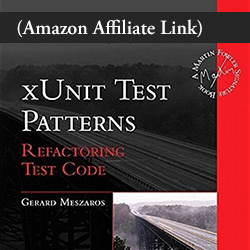 For as long as we’ve had XCTest (and OCUnit before that), tests have always been run in the same order. testA comes before testB. Implicit test case order means that we can create dependencies between tests, and not even know it. In the scheme editor, select Test in the left column. Then select the Info tab. For each test bundle, click the Options button. 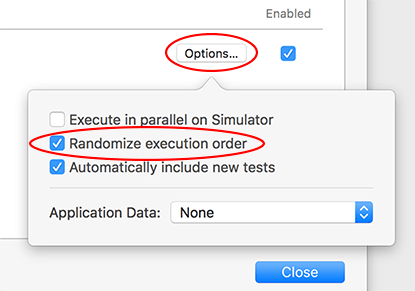 Then select the “Randomize execution order” option. Let’s do this for every test bundle within every scheme! Let’s assume we’ve been relying on the implicit test order without knowing it. There’s a chance that running the tests within a suite in random order will cause a hidden problem to manifest. Keep an eye open for tests that fail unexpectedly. But then what? With careful diagnosis, we might be able to take a stab at a solution. But the next time we run the tests, they’ll be in a different order. This could mask the failure. Then how do we know if we corrected the problem? We don’t! Not unless we can rerun the tests in the same order. RSpec gives us an example of doing this right. When you tell RSpec to run tests in random order, it prints out the seed it used for its random number generator. You can then specify that same seed to get tests in the same order. Until we get some way to lock down the randomized order, we won’t know whether we’ve eliminated any problems this feature reveals! The current inability to rerun tests in the same order keeps this new feature from being as useful as it could be. When Andrew Ebling and I took this problem to the Apple Labs at WWDC, the Apple engineer asked us to file a radar. And not just one. They said, the more reports they get of a given issue, the higher it goes in their list of priorities. So… here’s my Open Radar entry. If you care about seeing this XCTest feature become truly useful, please file a duplicate! Maybe we’ll get lucky and see this feature fleshed out by the time Xcode 10 is officially released. Have you filed any Radars for other XCTest features you’d like to see? Please share below, so that we can dup your tickets! Previous Post Joy! Xcode 10 Promises to Improve Test-Centric Workflows Next Post When You Refactor, Are You Using Small Steps?